This hat is for the oldest of the April Girls, hope she likes it, it’s named for her. I’ve learned not to expect to hear one way or the other. 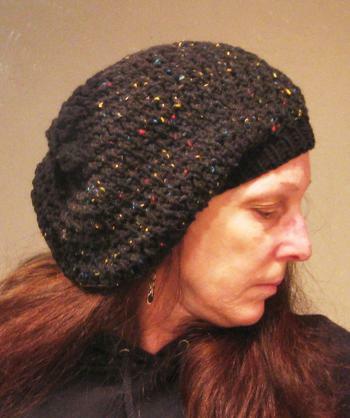 So I will model the hat….not that I like taking my own pix, just saying…. The Baby Turtleback fits with room to spare! Not bad for long-distance guesswork! We had a riot playing Patty Cakes together via web-cam. Rhonda’s attention held longer than the last time we attempted this, and we had a riot! Igor even got in the picture when he heard us playing, and you should have seen her eyes light up when she saw the Doggy! I do believe she remembers him and gets the biggest grin on her face when he comes into the room, just like when they were here back in November. I’ve got a renewed confidence now, from seeing how this actually fit her. It looked so small when I packed it up to send off in the mail. Back to work, I am making yet another hat, this one for…..to be announced.